PRICKIMAGE creates distinctive digital visuals for events and brands to make any space come alive with bespoke reactive projections and installations. “The ML750e had best ratio of size, weight, lumens and power consumption for our needs. As the unit needs to be powered by battery – it was essential we have the most energy efficient solution. “I trust Optoma and particularly like the fact they're black so less distracting for the performance. 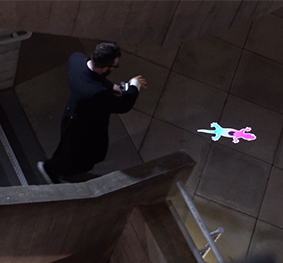 Challenge: Live video and mobile projection artist, Shaun O’Connor, needed a new model for his WALKPro3D performances that would be lightweight but powerful enough to create a bright image, have a low power requirement, wireless capabilities and a small inconspicuous form. Solution: The ML750e was chosen to work with a mini PC and a custom app that were installed with the battery in a purpose-designed harness. Bespoke 3D characters are manipulated and controlled using the hand gesture technology. Live video and mobile projection artist from PRICKIMAGE, Shaun O’Connor, needed an ultra mobile projector for his WALKABOUT Projection | WALKPro3D performances. WALKPro3D is the first of its kind - a small and mobile video projection system that can bring digital puppetry and 3D character performances to any location. 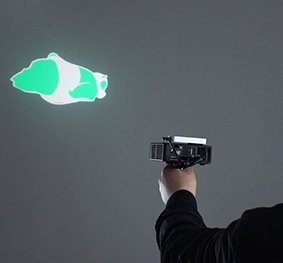 With no need for cables or screens it is a uniquely flexible projection kit. Shaun said: “The performance frees visuals from a static screen in a way that surprises and delights onlookers. The performers manipulate the projected images live, encouraging audience interaction using Leap Motion with Unity3D. “Together with PIKILIPITA, who oversees the 3D programming, we have been able to take live 3D gaming characters out of the bedroom and onto the streets using hand gesture like digital puppets. The new model for the WALKPro3D performances would need to be lightweight but powerful enough to create a bright image. It needed to have a low power requirement, have wireless capabilities and have reduced form factor so not to attract attention. Shaun chose Optoma’s ultra portable LED projector, ML750e. LED projectors use less energy than traditional lamp-based models and the perceived brightness from LED projectors can be twice that of an equivalent lamp-based model. The battery and equipment for the projection is installed in a purpose-designed harness that is worn under clothing – so invisible to the public. Bespoke 3D characters are manipulated and controlled using the hand gesture technology. Making it all fluidly interactive required an efficient mini PC and a custom app integration. Shaun added: “The ML750e had best ratio of size, weight, lumens and power consumption for our needs. As the unit needs to be powered by battery – it was essential we have the most energy efficient solution. “I trust Optoma and particularly like the fact they're black so less distracting for the performance. And as Arthur C. Clarke so eloquently put it, ‘Any sufficiently advanced technology is indistinguishable from magic’." Shaun used the ML750e as part of WALKPro3D performances for an UK Arts Council funded-project with the dance company Corey Baker Dance. It allowed the dancers to bring to life indigenous New Zealand characters with increased audience interactivity. WALKPro3D is not just for art performances. It can be applied to a range of environments and purposes such as PR events, product launches, festivals and experiential marketing campaigns. Shaun currently has multiple kits and is looking to expand internationally this year.